Progress is often incremental, says publisher Jason Low, and the book publishing industry moves slowly. The week’s news bears out the thesis. It’s good news for those who are looking for more diversity in the media. But one award does not a trend make. 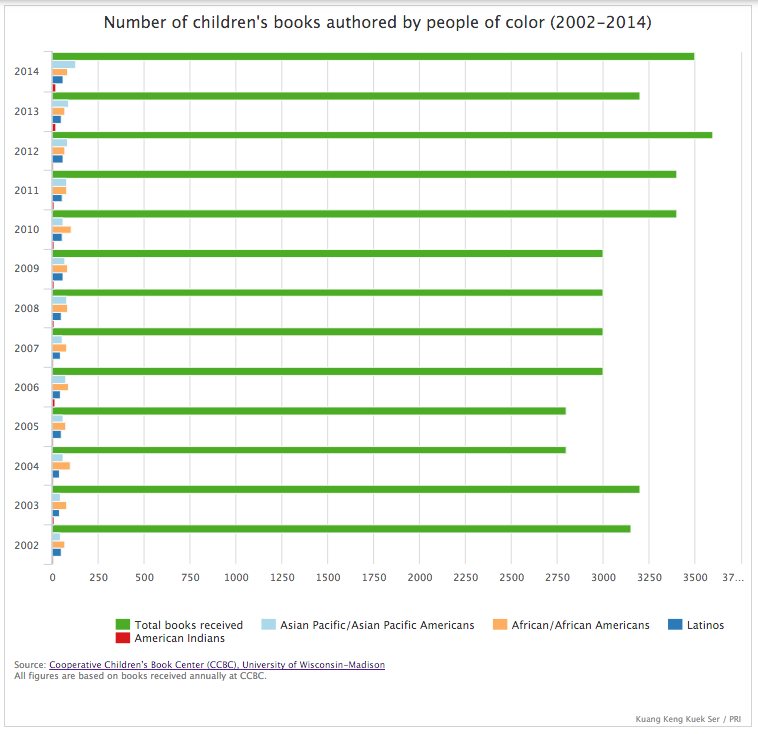 Less than 10 percent of books for children in the US are by people of color and about the same percentage are about people of color, according to statistics from the library collection at the Cooperative Children’s Book Center at the University of Wisconsin. So who works in the book industry? Learn more about a new survey at PRI.org. It’s not an uncommon feeling for people learning about what’s happening in Flint, Michigan, these days. It was Aida Cuadrado’s reaction last week. She’s the director of Action of Greater Lansing, a network of churches that do faith-based community organizing. Over the weekend, they took a large truck plus three SUVs full of bottled water to a member church in Flint, specifically to reach some 1,000 undocumented immigrants who have been affected by the high levels of lead in the city’s water. Read more about her organization’s efforts at PRI.org. Amer Mohammad has a decision to make. While refugees are camped out, protesting and demanding safe passage from Turkey to Europe, Amer must decide if he will wait and how long he will wait for an answer about his future. The United Nations and the German embassy, he says, have said it could take years for him to get paperwork to move, and there’s no guarantee he will actually be allowed to go anywhere — let alone where he wants. In the meantime, he is not allowed to legally work in Turkey. So he’s joined a camp of refugees outside Istanbul’s main bus terminal. Filmmaker Zhu Rikun is homeless. Not literally, but in a philosophical way. Zhu was the artistic director of the Beijing Independent Film Festival from 2006 to 2011 and is an acclaimed producer and director of independent film in China. In the years before he left Beijing, he was monitored, placed under house arrest and detained by authorities. The festival was shut down last summer. Zhu moved to the Hudson Valley, New York in the fall under a visa program for artists of extraordinary ability. In a sense, both Zhu and the Beijing Independent Film Festival have become homeless, squeezed out of China’s increasingly tight space for artists and activists. Next month, his film “The Dossier” will be screened in New York City as part of a special series of independent films from China. A sort of stand-in for what was blocked Beijing, Cinema on the Edge is an almost month-long event of 27 films curated from the Beijing festival that never took place.